All hell has broken loose. Constable Dent is on a rampage and the formerly green gardens of Japan have been corrupted. After a brief hiatus, Rick Remender and Sean Murphy come back with guns blazing giving us the most adult issue in the series. 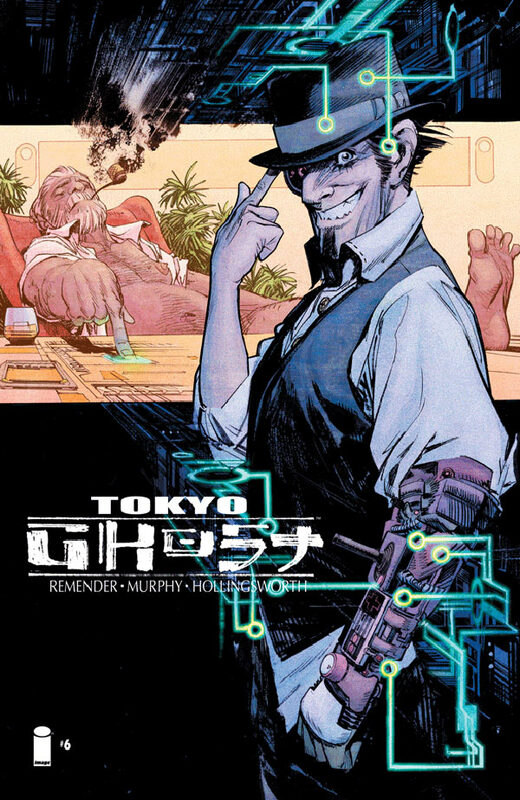 So be warned, this is rated R stuff but that aside, 'Tokyo Ghost' #6 opens another exciting chapter where Flak broadens his power with Dent as his puppet. With Debbie Decay out of his life, Dent is mainlining digital content again and working as Flak's enforcer. Untethered and without Debbie to rein him in, he's as deadly and efficient as ever before. The action-packed issue has him up against a terrorist group fashioned after nursery rhymes and it's as wild as it sounds. I can't think of a better team than Remender, Murphy and colorist Matt Hollingsworth to choreograph such an exhilarating chase scene full of visceral movement and color. It's kinetic and gory but brilliantly paced and laid out precisely for maximum carnage. There's no holding back on the political satire either, this is written by Remender after all, and when the media coddles politicos it's not just lip service. The vulgar world of New Los Angeles has engulfed Tokyo replacing the former serenity Dent and Debbie once shared before he single-handily destroyed it. As much as this issue establishes the new world order it also briefly introduces Debbie's new role. Things have changed dramatically, taking a darker somber turn with only the slightest bit of hope and light. Murphy and Hollingsworth continue to do some of the best art in comics. There just aren't enough superlatives left to shower on these talented artists. There's so much detail and creatively shot panels with dynamic colors that the action never lets up and your eyeballs are glued to every page. 'Tokyo Ghost' is back and bolder, crazier, and more gratuitous than ever. We even get clarity about the title but this cyperpunk Blade Runner-on acid series is just getting started in its second arc. Gone is the peaceful splendor of Tokyo Gardens and we're right in the thick of the maelstrom with Dent mowing down everything in his wake. Make sure to get on board of the crazy train and add this to your pull list.